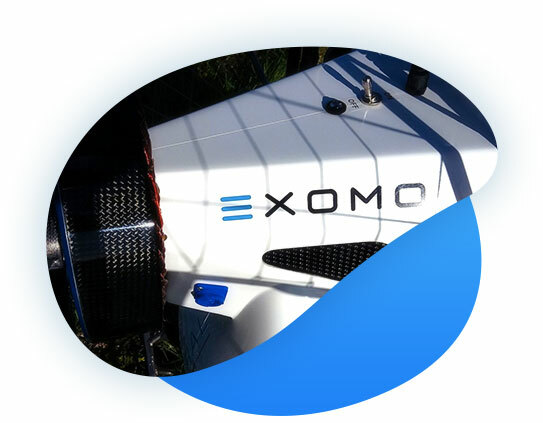 EXOMO offers the most reliable electric propulsion on the market, complete with its high-capacity battery and a charger to power the paramotors or light aircrafts. With its integrated monitoring systems allow the pilot to fully concentrate on the flight. Equipped with a 15Kw engine (+20 HP), this electric paramotor engine provide 70 Kg of thrust and its unique design allows for short dynamic flights around the field or long trips. It is simple to start and you enjoy an incomparable silence. The EXOMO packs are equipped with an adaptable bracket for quick installation on existing paramotor frames with either a built-in or mobile battery. You can also purchase a complete paramotor with your frame and wing options. The latest generation Li-Ion batteries allow significant energy storage. You can modulate the weight and autonomy with a lighter machine for training and local flying around the field or a large capacity for longer trips. The lightweight and durable carbon or composite (Copyrighted) engine mounts allow easy adaptation to existing frames. Their design protects the electronics from external elements while allowing efficient engine cooling. The high-performance, compact and low-noise engine has been tested in the most difficult conditions, offering reliability and exemplary power, its 15 Kw equivalent to a 20 to 25 hp gasoline engine. A powerful and lightweight controller manages the power: it is controlled by a conventional acceleration handle equipped with a control screen to easily view the capacity of the battery in flight. The E-props carbon propellers, light and optimally built, allow to modulate the thrust. The EXOMO are supplied with a two-bladed propeller and an option for a maximum thrust with 3 or 4 blades. The Li-Ion batteries are assembled in our workshop with high-quality and latest-generation cells. They have 15 elements (instead of the usual 14) to allow optimal performance and permit the use of multi-blade propellers.